Glasfloss Magna HEPA Commercial Filters are used in filter applications for hospitals, data centers, nuclear facilities, pharmaceuticals, laboratories, aerospace, food processing and optics. The Commercial HEPA Filter Replacement 23.3" x 11.3" x 11.5" Standard Capacity is the correct replacement for the Glasfloss Magna MAGGD23F11FB5P. The Commercial HEPA Filter Replacement 23-3/8" x 23-3/8" x 11-1/2" High Capacity is the correct replacement for the Glasfloss Magna MAGGD23F23FB5PH. The Commercial HEPA Filter Replacement 23-3/8" x 23-3/8" x 11-1/2" Standard Capacity is the correct replacement for the Glasflow Magna MAGGD23F23FB5P. The Commercial HEPA Filter Replacement 24"x12"x11.5" High Capacity is the correct replacement for the Glasflow Magna MAGGD2412B5PH. The Commercial HEPA Filter Replacement 24"x24"x11.5" Standard Capacity is the correct replacement for the Glasflow Magna MAGGD2412B5P. The Commercial HEPA Filter Replacement 24"x24"x11.5" High Capacity is the correct compatible replacement for the Koch Glasfloss Magna MAGGD2424B5PH. The Commercial HEPA Filter Replacement 24"x24"x11.5" Standard Capacity is the correct replacement for the Glasfloss Magna MAGGD2424B5. 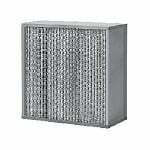 The Commercial HEPA Filter Replacement 23-3/8" x 11-3/8" x 11-1/2" High Capacity is the correct replacement for the Glassfloss Magna MAGGD23F11FB6PH. The Commercial HEPA Filter Replacement 23-3/8" x 11-3/8" x 11-1/2" Standard Capacity is the correct replacement for the Glasfloss Magna MAGGD23F11FB6P. The Commercial HEPA Filter Replacement 23-3/8" x 23-3/8" x 11-1/2" High Capacity is the correct replacement for the Glasfloss MAGGD23F23FB6PH. The Commercial HEPA Filter Replacement 23-3/8" x 23-3/8" x 11-1/2" Standard Capacity is the correct replacement for the Glasfloss Magna MAGGD23F23FB6P. The Commercial HEPA Filter Replacement 24"x24"x11.5" High Capacity is the correct replacement for the Glasfloss Magna MAGGD2412B6PH. The Commercial HEPA Filter Replacement 24"x24"x11.5" High Capacity is the correct replacement for the Glasfloss Magna MAGGD2424B6PH. The Commercial HEPA Filter Replacement 24"x24"x11.5" Standard Capacity is the correct replacement for the Glasfloss Magna MAGGD2424B6P. The Commercial HEPA Filter Replacement 24"x24"x11.5" Standard Capacity is the correct replacement for the Glasfloss MAGGD2412B6P. The Commercial HEPA Filter Replacement 23.3" x 11.3" x 11.5" High Capacity is the correct replacement for the Glasfloss Magna MAGGD23F11FB5PH filter.